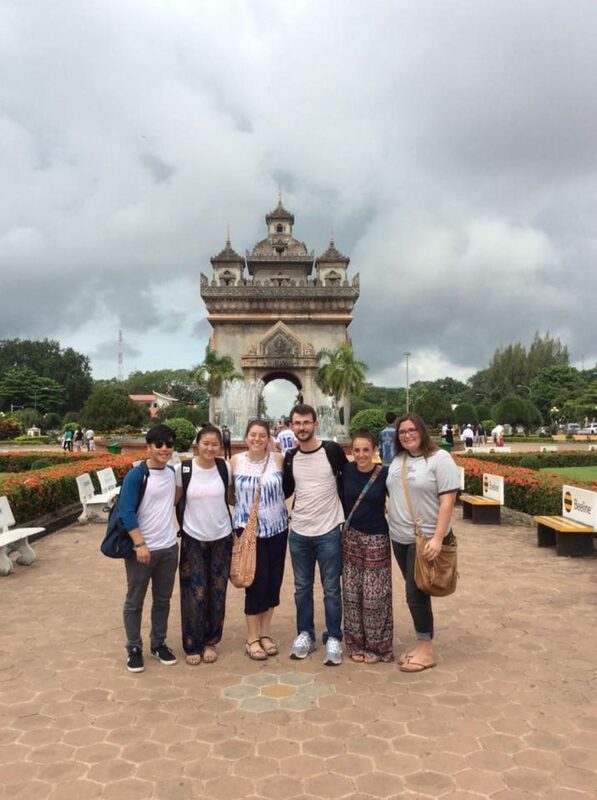 I got to Vientiane on Saturday June 24th. My first week felt so busy. We started by going to be the night market to buy our sinhs for school. We arrived early and walked by the Mekong River and as it got darker, the night market got busier. By sunset, it was packed with people bargaining over clothes, food, paintings, electronics, and anything else that could possibly be sold. Come Monday, it was time for school. Ajan Bounmy taught our beginning level class. After the first day I realized that pronunciation would definitely take practice. But by the end of the week I was starting to catch on. 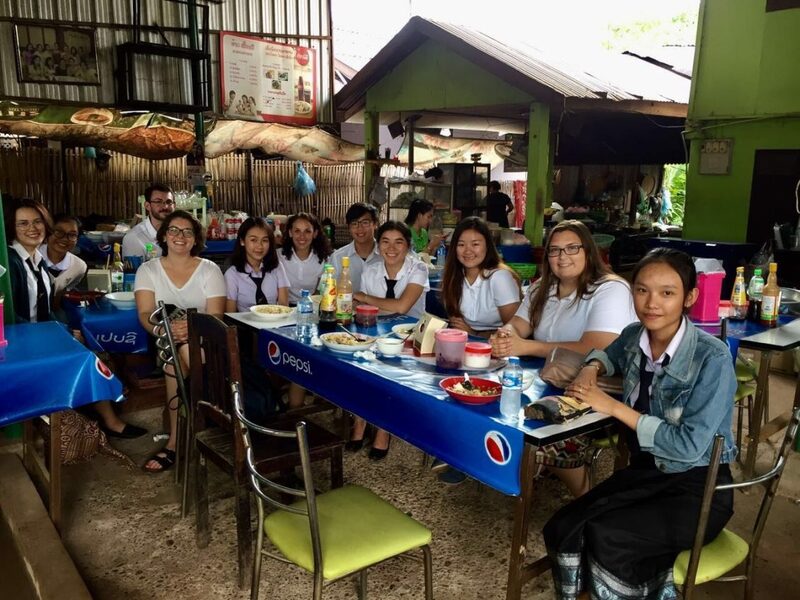 After our first week of classes the SAILers took a group tour around Vientiane led by Lada. We started at That Luang which I had seen near the hotel. 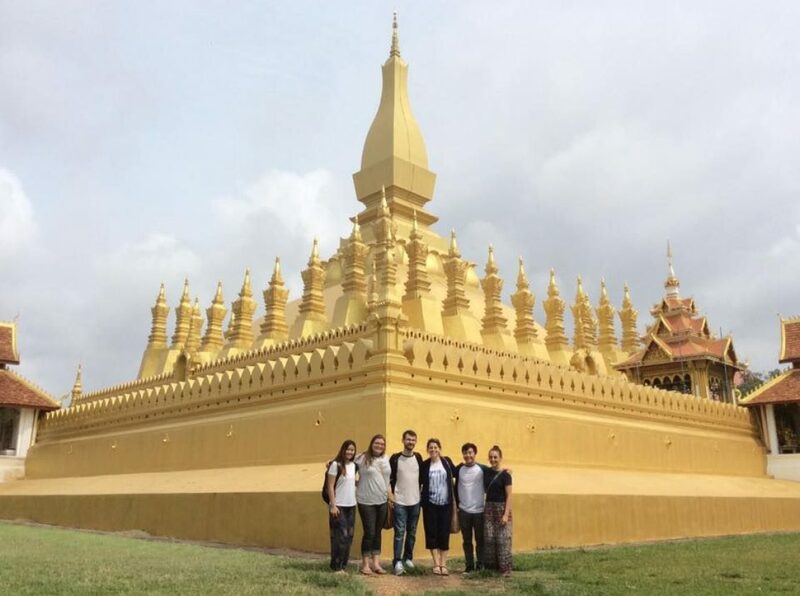 At the beautiful gold stupa we had our first experience with Buddhist practices. 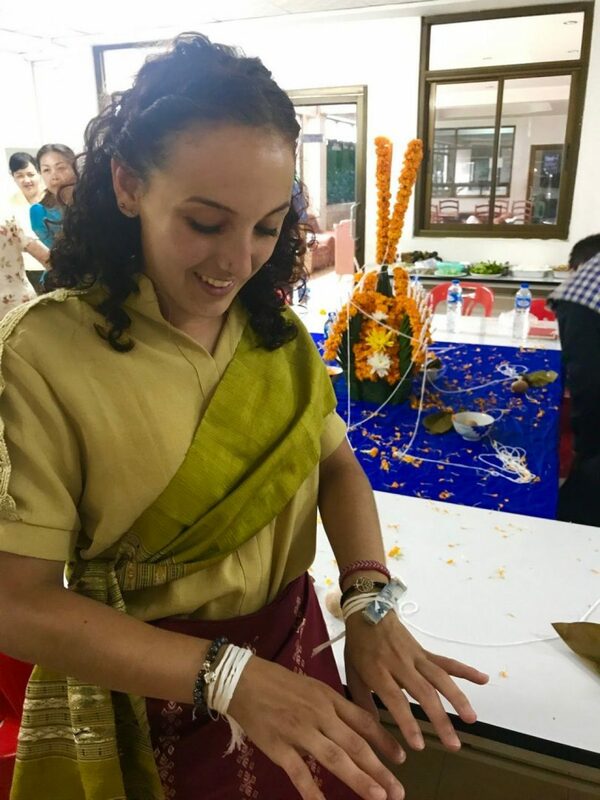 Lada showed us how to pay our respects by bringing offerings of incense, flowers, and candles to the altar where we knelt down and bowed our head to the group three times. We performed the same ritual at Wat Sisaket and Wat Phra Kaew, both breathtakingly beautiful. My favorite part of the day however was towards the end at Buddha Park. About 30 minutes outside of the city we got the park filled with at least 200 Buddha statues. Walking through the park surrounded by the massive stone Buddhas was awe inspiring and the perfect end to my first week in Vientiane. 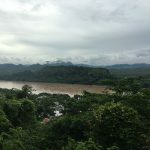 By week two I was starting to used to life in Laos. 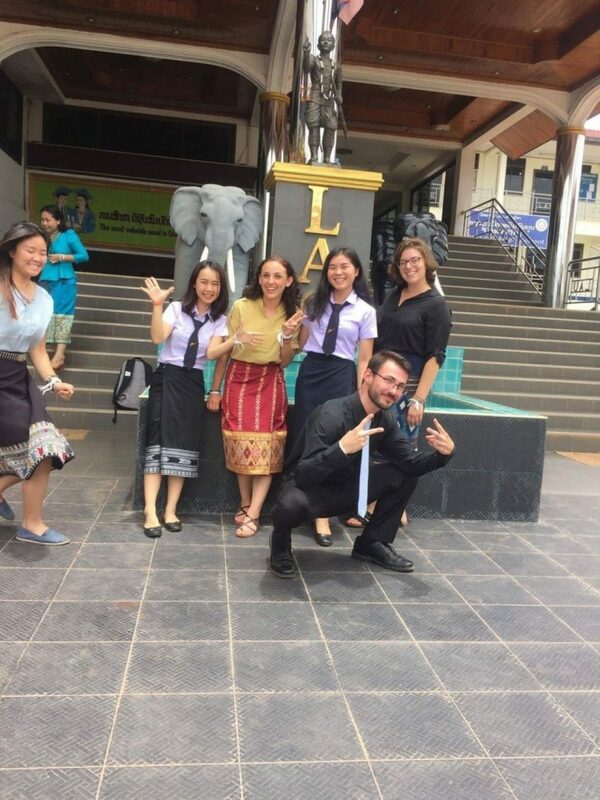 I was getting accustomed to walking to class, ordering food in Lao at the local restaurants, and exploring with my roommate, Christina. Unfortunately pretty soon after I started getting into the rhythm of life in Laos I got super sick. I must have picked up some sort of stomach bug that left me stuck in my room for a while. Luckily the antibiotics helped a lot and I was back to normal within a few days. On my first day feeling better we visited the COPE center. This visit was one of the most touching experiences I had on the trip. 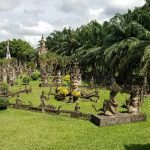 I knew about the Secret War and that there was still unexploded ordnance in Laos but I had no idea how lasting the effects were. 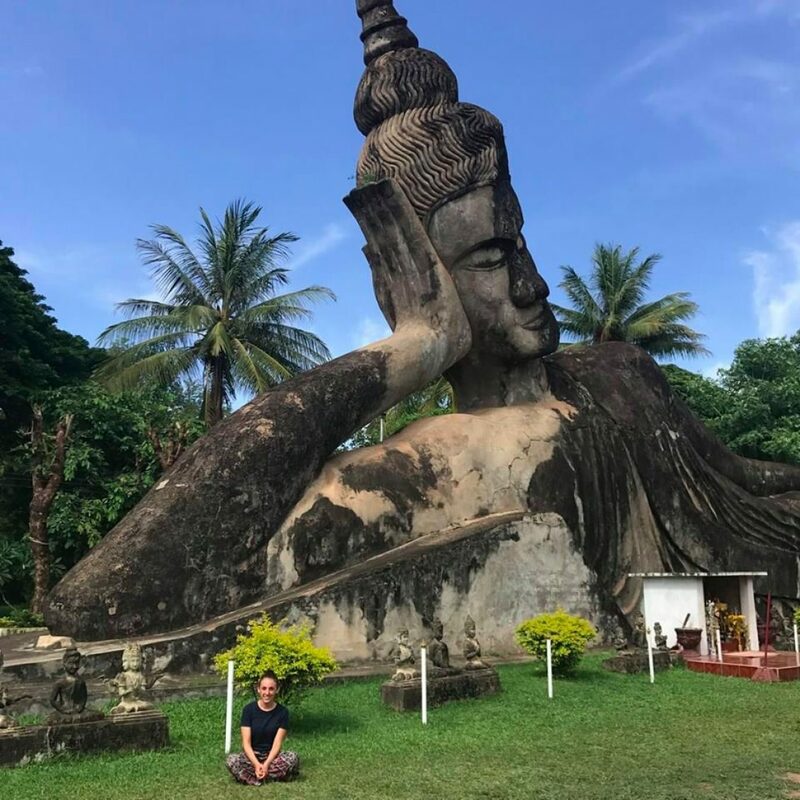 After reading the stories of those affected by the aftermath of the war and after seeing the documentary from COPE I am determined to come back to Laos as a volunteer. 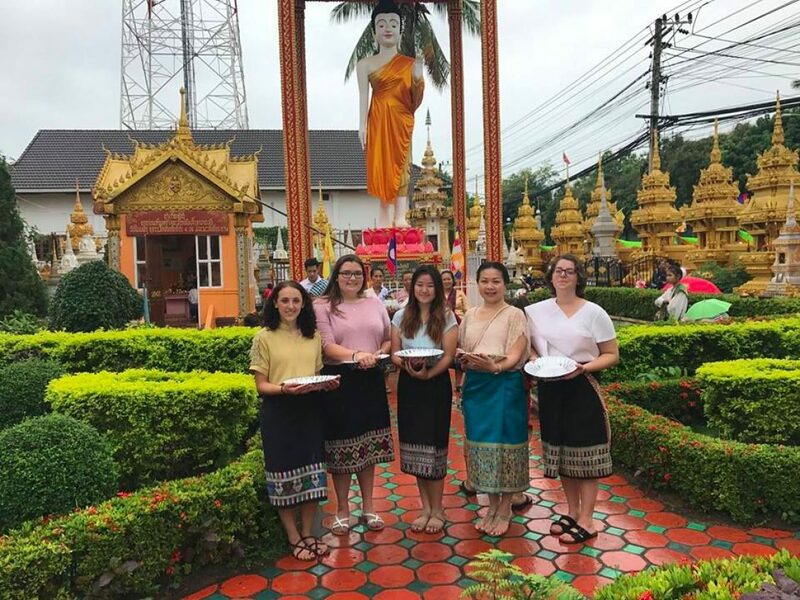 That Saturday our group had the opportunity to participate in the ceremony that marks the beginning of the three month Buddhist lent, Almsgiving. We all wore our nicest clothes to bring offerings to the temple that Lada had prepared. Inside the temple an older monk in orange robes chanted and the whole room repeated it, echoing throughout the room. Back outside, we all waited in line to give our offerings. We lifted each offering to our head just as we watched the locals do. At the end of the day we went to Dr. Inleusa’s house and spent the evening cooking at her home. She bought all the ingredients for us to make the traditional Lao dish, lap. After what felt like forever of washing and cutting vegetables and cooking and mincing duck meat, we had an amazing dinner. Week 2 ended just as good as week 1. Two really fun things happened this week. The first thing was meeting my language partner, Kina. We all got lunch together on Monday and she showed me a new dish I could try that I immediately added to my list of foods I could order. We had a great time laughing while she tried to show me how to use chopsticks which was eventually given up on (I’ve never been able to use them). She was so patient with me while I remembered back to the lessons we had learned in class so I could make sentences. Although my words were often out of order, she usually understood what I was trying to say and helped me expand my vocabulary. I spent most of this week excitedly looking forward to our long weekend trip to Luang Pabang. And I have to say, it exceeded expectations. Although I loved that entire trip, it had two main highlights. First was going to the Hmong village where we bought bracelets from the local children. They were so sweet with the warmest smiles that got me emotional when they chased our tuk-tuk to wave goodbye to us. Second was getting to ride elephants. 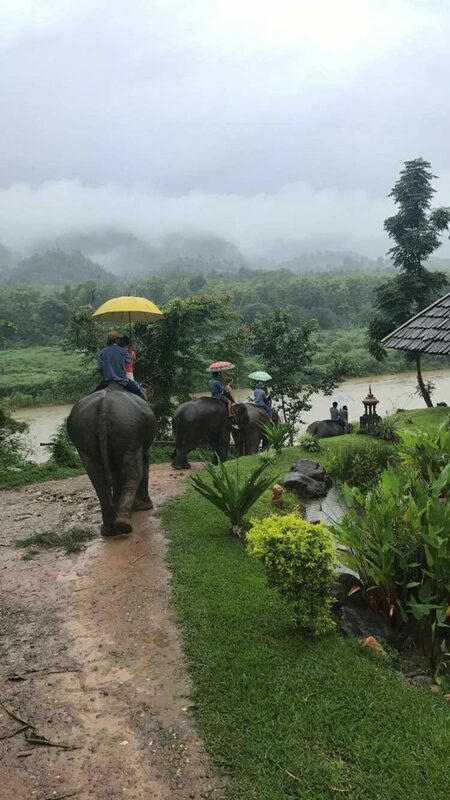 This was something I had wanted to do for a long time and getting to ride the beautiful animals through the great Mekong River in a tropical storm. Having to leave this city was so difficult but in the end I know I’ll be back some day. This week was really great for me because my Lao began to improve. In the past weeks I’d had some trouble with some of the lessons and was starting to get frustrated and worried about falling behind. But during this week I made a lot of progress. My reading got much more fluid and I could better understand questions made to me. 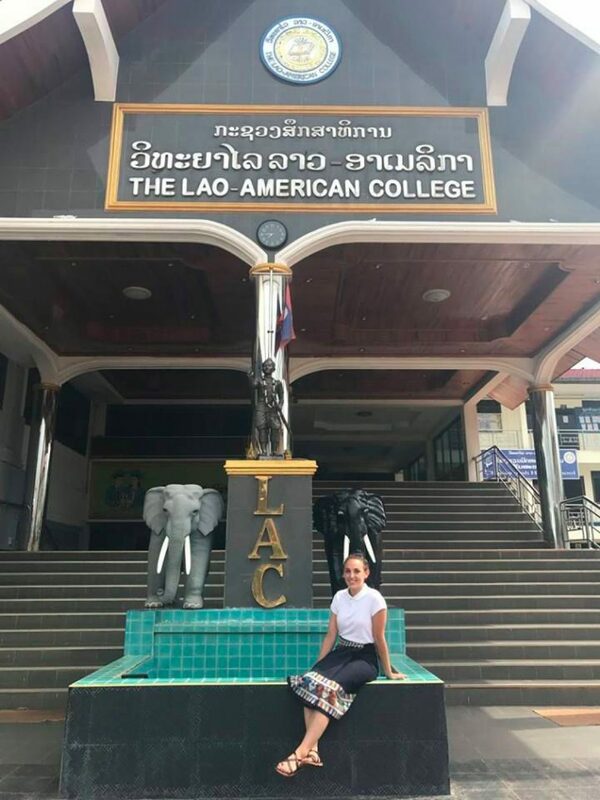 It was especially great when I went out one night to the night market to get food and successfully told our tuk-tuk driver where I wanted to go, got him to lower the price of the fare, and then have a short conversation with him about being in Laos to study at the Lao-American college. 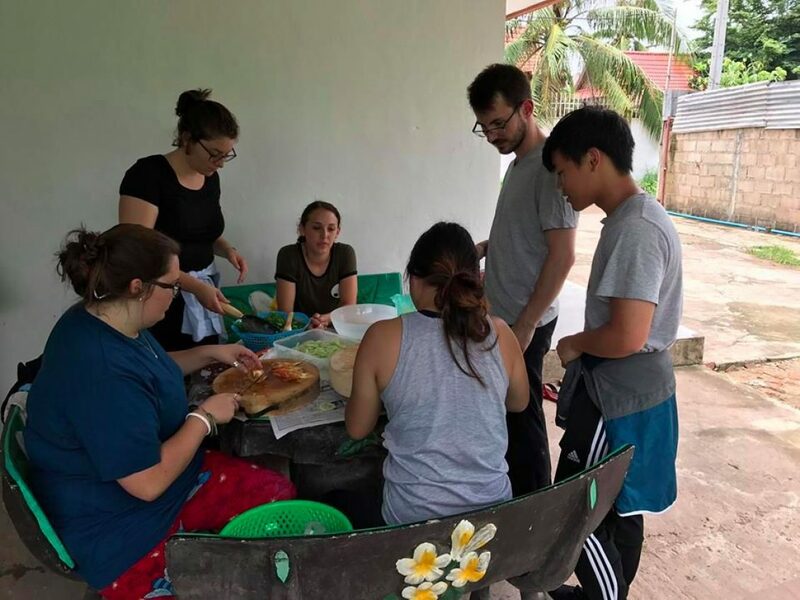 It felt pretty good to be able to communicate in Lao, even if it was basic. 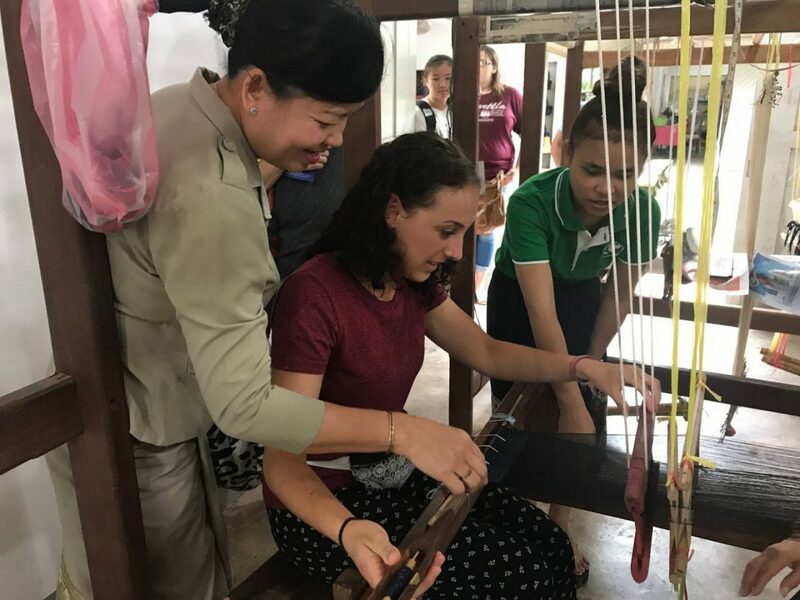 Our outing this week was to a silk shop where we got to see how the silk was dyed using natural dyes and then woven skillfully into gorgeous skirts and table runners. After seeing how much work goes into one skirt, I have a newfound respect for the women who weave them. After trying to use the weaving loom, I realized I definitely do not have a future in weaving! This week I also started to realize that Vientiane feels a little like home now. After four weeks, a whole month, I had come to love living here. The woman at the restaurant across from the college would always help us order in Lao. The family who sells buns actually started to recognize us and would immediately open the bun case when we walked up. And as someone who cannot stand wearing skirts, the sinh had actually started to feel normal. At the end of this week I realized that I only had one week left in Laos and it felt strange to know I would not be making my walk to class anymore across the busy streets of Vientiane. The beginning of this week hit me like a ton of bricks. Was I really leaving at the end of this week? 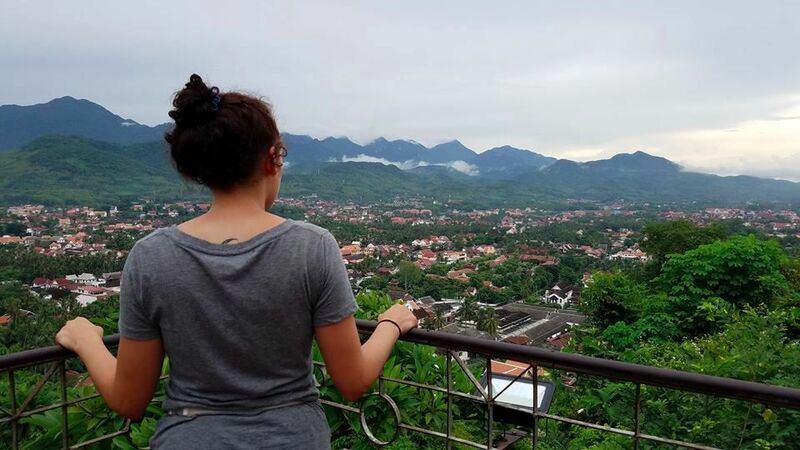 As sad as I was about leaving Vientiane, I had no time to think about it because I was too focused on studying and getting ready for my finals. This week consisted mostly of the SAILers taking group excursions to Amazon or Joma cafe after class everyday for caffeine and studying. I knew writing was definitely my worst subject so I mainly focused on writing the answers to questions and making sure I could spell. On final day, I was so nervous. As we got called in one by one to read and answer questions I got more and more nervous. But in the end, I did fine. I am very pleased to say I passed both the Language and History portion of the SAIL program. After five weeks of classes and studying it felt so strange to be finished. 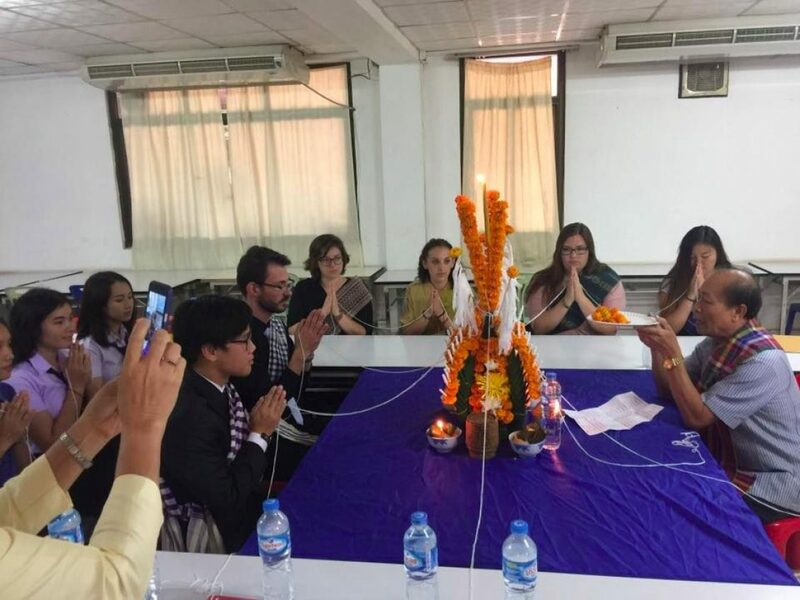 Our time at the Lao-American College was commemorated with a Baci ceremony where Ajan Bounmy performed the speaking of the ceremony and then the teachers all threw flower petals onto us. Each of the teachers and those involved with the SAIL program then tied a string around our wrists with wishes of success and happiness. Then our language partners came and did the same thing. I was so happy to have completed the program and so sad at the same time because it was all over. After five weeks of studying and making memories with these people I was not ready to say good-bye. SAIL has had a huge impact on my life and I am so grateful to have been a part of it with such incredible people. I cannot wait until I get to return to Laos.